Being subtle in the House of Commons is not particularly easy, let alone encouraged, so maybe it’s no surprise that Siobhain McDonagh (Labour, Mitcham and Morden) has gone full out neon-lit cuckoo-bananas with her Bash The Coalition Bill. The idea behind the proposed law – which has no chance of progressing much further – has a sound core. It’s just the rest of the structure around it which lacks integrity. Surrounding the central argument is rice-paper and silly string, a ragbag collection of thinly veiled partisan attacks. It’s not surprise to me that a Labour politician wants to nobble electoral administration to benefit the Party; such an attitude was the basis behind their shameless attack against AV and the childlike squealing of ‘gerrymandering!’ during the ultimately killed off boundary change process. Nothing pleases Labour more than keeping the voting system and electoral administration firmly in their grasp, and McDonagh’s proposed Bill ensures the grip is tighter than ever. One line of attack in the Bill – formally “Electoral Register (Access to Public Services)” – rubbishes individual electoral registration. The move to IER removes the nonsense of the ‘head of the household’ having the power to register (or in most cases, deliberately not register) people living at an address. In my “previous life” as an electoral candidate, it was something of an open secret that manipulation of the registration process by ‘head of the households’ and related problems with postal votes excluded women and young people from voting. IER will go some way to alleviate that problem. McDonagh tries to make a negative thing out of the loss of voters in Northern Ireland when they switched, ignoring the fact that many of the missing names on the Norn Iron voting register probably didn’t exist in the first place. Or indeed had been long since deceased. If someone does not like living in a democracy, that is fine, but they should not expect all the good things that democracy offers in return. It’s a wonderful piece of homeless prejudice too, as it completely misunderstands the journey many vulnerable people have to take to seek help. By making the register a form of National Registration Scheme, McDonagh takes the basis of democracy and squishes it into a flattened Colgate tube. Reaction to her idea has been largely negative in the real world, where McDonagh and other MPs ignorant of democracy tend not to live. Readers of a certain age may recall the fallout from the Poll Tax, during which time the electoral register shrank across the country as people tried all the could to avoid paying charges they couldn’t afford. Linking the electoral register with any kind of State benefits or crime-fighting purpose is therefore toxic in some areas, particularly Labour-leaning cities such as Liverpool or Glasgow which saw the worst of the backlashes. If McDonagh understood the problems people have with the words “electoral” and “register”, she would have realised that threatening to withhold benefits for non-registration sounds like a police sanctioned threat. 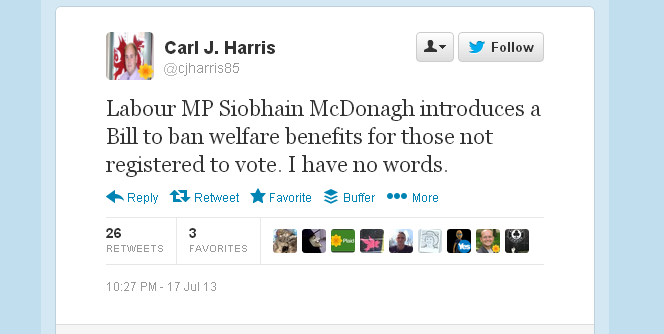 It’s not the language of politicians generally let alone specifically Labour. This horrible, twisted and offensive Bill will die a quick death, as the Parliamentary process is not kind to Ten Minute Bills and their related brethren. In the case of this proposal, which threatens women and children with social exclusion and places power in the hands of unscrupulous landlords, nothing could be kinder than a shot to the head. What a shambles. Saying the BNP is a racist group is as obvious as observing the sun is hot. More needs to be done to point out their economic policies, as thin as rice paper. Their education policies are divisive and destructive. How proud will Britain stand as an isolated nation stripped of doctors, teachers, chefs, carers, all stripped of their lives through the deluded prejudice of shallow fools in shoddy suits? Economic, political, and cultural suicide will flow from this Monday, a date when it seems sadly inevitable that the far-right extremists will be sent to represent the United Kingdom in the European Parliament. Playing the race card is easy, it’s how the BNP loves its rivals to perform. They have been known to talk about council tax, litter collection and speed humps just to underline how everybody else is blabbing about skin colour. The problem is falling into this trap, a clever but easily beatable ploy from the barely reformed knuckledraggers. Corruption in modern day politics may get media attention, but the track record of some BNP members is its own brand of scandal – violent crime to name just one. A country whose language is living proof of the benefits and product of integration and immigration should not have, waving a Union Flag at a massive cost, representatives from an extreme and racist organisation. A country where music and fashion shows the results of integration cannot allow the isolationist ignorance of the BNP to flourish. They have learnt how to make headlines, what to say on the doors to mask their real agendas, but ultimately retain their pathetic and baseless offensive racism. In 2008, Richard Barnbrook was lifted to the highest elected position of any BNP member when 130,714 votes took him into City Hall as a member of the Greater London Assembly. One of twenty-five members who ultimately keep checks and balances on Mayor Boris Johnston. However Barnbrook acts the consequences are quite clear – his election gives credence to an outfit without credibility. His election was the result of a particular brand of disquiet with the political establishment; clearly the current climate has fed their particular fire. Ordinary people know how the BNP hide behind words polished far more than any cynical member of Westminster’s club. Enough people need to turn out on June 4th to give weight to their disquiet, to allow democracy to return to a stable footing. 130,714 is a figure nowhere near enough to award the party of Nick Griffin a seat in Brussels. The North West England region is a target for them, with Mr Griffin at the very top; in 2004, the BNP failed to get a seat with 134,959 votes. There are a lot of people between Carlisle and Crewe who feel the only party who represent “none of the above” is the group whose policies would ultimately create a Britain which has never existed. Such ignorance of the island nature of this country is their most pathetic characteristic of all. For the good of long-term growth in the UK, one tiny event must be carried out which will take no more time than writing out an email, a status update, a ‘tweet’. Vote for change, the environment, cohesion. Vote against the pathetic. Vote against the BNP.